One of the most fantastic websites that I’ve discovered this month would have to be one called ‘Launch’ which has been bought to us by Yahoo – seemingly, out of nowhere came this excellent Internet site which allows you to pick from hundreds of music videos, MP3’s and artist interviews all completely free of charge and for a change this is available completely legally. As I really don’t know where to start with this site, we’ll begin by looking at the music videos section which immediately presents you with a long list of artists or allows you to search and quickly find the artist you’re looking for. Once you’ve found you’re desired artist, the site will list all music videos that it has in its comprehensive database for you to view at your pleasure completely free of charge. To fully take advantage of this area of the site it would be advisable to have broadband installed as on such a connection each video takes around 4 seconds to load up then plays at high quality and completely stutter free to the end; something you wouldn’t achieve with a 56k modem. This is all very good if you know that you want to watch and have nothing else to do than sit down and watch a music video but what if your concentration is needed for something else and you just would like a bit of background music? 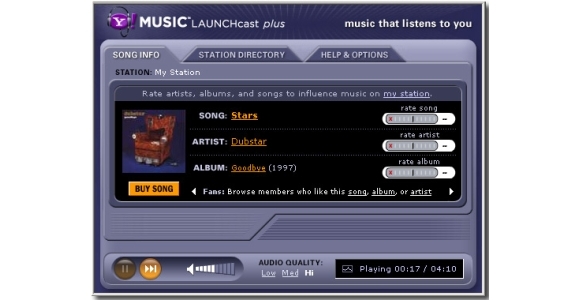 This is where the LaunchCast online radio station comes in – You simply decide which types of music you like listening to and Yahoo customizes a station specifically for you which then sits in the background playing away whilst you continue with your work. By specifying genres of music that appeal to you, the station can ensure that you don’t have to endure 30 minutes worth of Gareth Gates’ ‘Spirit in the Sky’ per day that a certain local station would impose on you. I think we all know which station I’m talking about. On the whole, the songs are fresh, varied and the interruptions for adverts are few and far between and even at this point in writing the article I’ve already heard three songs today that I’ve never heard before and that were absolutely fantastic – It really is a great way to discover new music. If a track does come on that I really can’t stand then just click on ‘next’ and the station will skip it and to avoid having to do this too often you are asked to rate each track accordingly so that the radio station can get a feel for what music appeals to you and what doesn’t. Other areas of the site include the artist information page where you can check out news, photos and interviews as well as downloading selections of their music on to your hard drive for future listening when you’re disconnected from the Internet. Launch not only supports established artists but also does its bit for supporting emerging artists by selecting a different one to feature every month on the site so that you can view their music videos, listen to their singles and having a look into where they’ve come from and what has influenced their entry in to the music business all from the one page. To conclude, it is very unusual that I am so impressed by a site so if you only do one thing today, make that you check out Launch especially if you have a broadband connection. Although areas of the site would work fine on a standard connection, I believe that waiting for everything to loads up would become a slightly tedious process. Much in the same way that the quality of Sky has pushed the majority of the population towards getting digital TV, if demanding content like this keeps appearing on the Internet then it’s only a matter of time before most people are pushed towards installing Broadband in their homes for fear of being left behind.